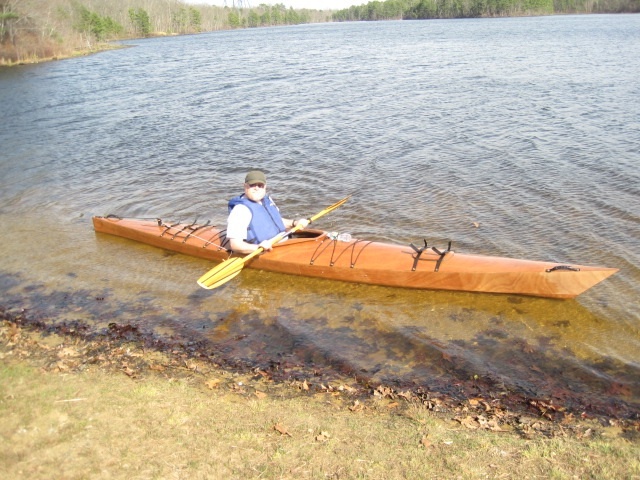 Tom Fulton built this Chesapeake Light Craft 17 kayak from a kit. CRISPO is 17′ long with a 2′ beam. This was Tom's first build. He launched her on April 11, 2011 on Prospertown Lake in Cream Ridge, NJ, and will use her as a sea kayak along the Jersey shore. Tom's wife, Karen Overbye, took this photo of Tom in CRISPO's cockpit. Plans, classes, and kits are available from Chesapeake Light Craft.